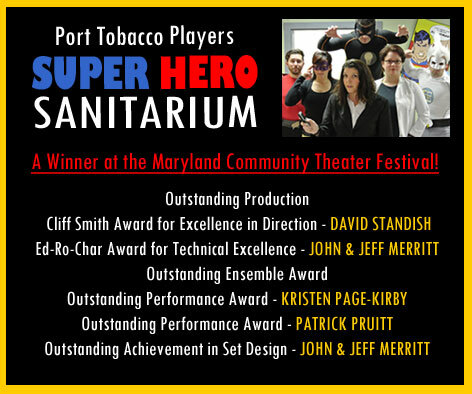 PTP won awards at the 2007 Eastern States Regional Theater Festival for Outstanding Achievements in Ensemble Acting, Outstanding Production Design, Excellence in Directing and the Outstanding Production award for “Never Swim Alone”. PTP is a recipient of the British Embassy Players prestigious Ruby Griffith Award for All Around Production Excellence in Community Theater for “A Raisin in the Sun” (2001) and Second Runner-Up for Outstanding Achievement in a Play for “Social Security” (2000). Outstanding Cameo in a Musical - Lydia Kivrak as "Grandma Tzeitel"
Outstanding Cameo in a Musical - Jacob Traver as "The Fiddler"
Outstanding Featured Actress in a Musical - Amy Dolan as "The Mother Abbess"
Outstanding Featured Actor in a Play - Randy Tusing as "Thomas Cromwell"
Outstanding Featured Actor in a Play - Michael J. Margelos as "The Common Man"